Is there an easier way to use create a stutter effect in Logic for something like a riser or anything else WITHOUT side-chaining to the noise gate plugin? I've only seen tutorials like this. By the way, I know that they're NOT using Logic Pro X in the video. They made their gated effect so easy and it seems like you have to do way more work in Logic to get the same thing done. 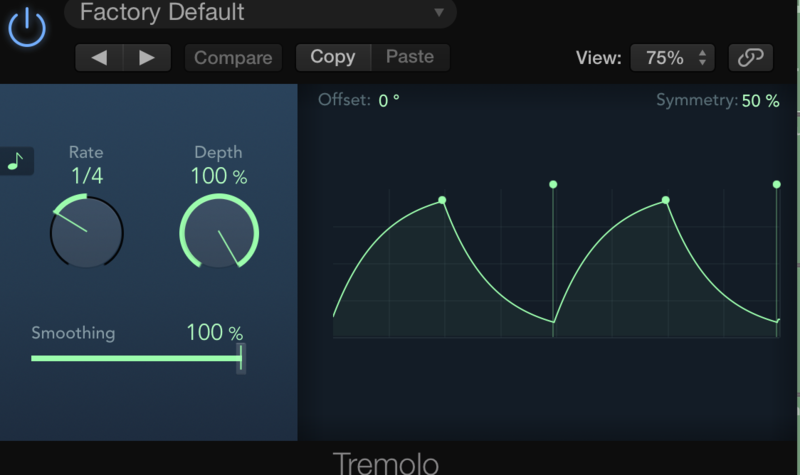 A tremolo plugin may be exactly what you need. It's under the modulation plugins and creates a stuttery type effect. The higher the depth the higher the on/off jumps in level will be. You may be able to use automation with this to get the "speed up" stutter effect. Not the answer you're looking for? Browse other questions tagged production logic-pro effects or ask your own question. I love with Ableton Live as a composition tool (session views). But I can only use Logic Pro X for studio mixes. What can I do? Using an ocarina in Logic Pro X? What instrument/synth or effect is this? Logic Pro: Does a looped segment have to start with a full loop?